Click here to check out custom made hoops! The circle is the primary geometry by which all things exist. Discover awareness of Creator Magic. My name is Caroline, and I have been living the hoop life since 2011! I could tell the story of how hooping dramatically changed my life, unlocked the strength and love of dance in my body, gave me a form of movement I am obsessed with doing, increased my confidence and opened doors I never imagined existed for me before I identified as a hooper. My story mirrors your own and that's why I would like to deliver a very important message to you: we are all one and this circle is a primary tool for that discovery. Doubtless you have felt magic in your state of flow. It's the Universe reminding you of that which you already know deep down inside. You are a powerful creator of reality as we all are. Within every part of you exists the divine that connects you to everything else, and the complexity of the entire natural universe is reflected by the simple sacred geometry of this circle you dance with. We have all the answers inside of us, even the ways to change the collectively destructive story we are currently telling on this planet. It begins with looking inside yourself and listening to your heart, as you did when you first picked up a hula hoop and decided that yes, this is something I can do. You have already learned that you can achieve what once seemed impossible when you spent months attaining that technical trick. Taking action on the circle through space and time, you created a new reality out of what began as a thought and a feeling. What would happen if you applied this concept to every part of your life? Keep "playing" with your hoop. Tap into those beautiful patterns of vibration and make them visible to the whole world through your dance. Look to your heart and your gut whenever you have a decision to make. It is the Universe's thrill to surprise you with opportunity and synchronicities, as when you discovered hooping. Use that feeling as a moral compass. The hoop has gone viral in the greater populace not once but several times throughout recorded history. Circle consciousness is on the rise and this is happening again. This time it will be recognized as a bringer of spiritual education for the masses, sparking a geometric revolution. You’ve witnessed the web of influence that hoops occupy in our culture expanding, and play a vital link in that growth. 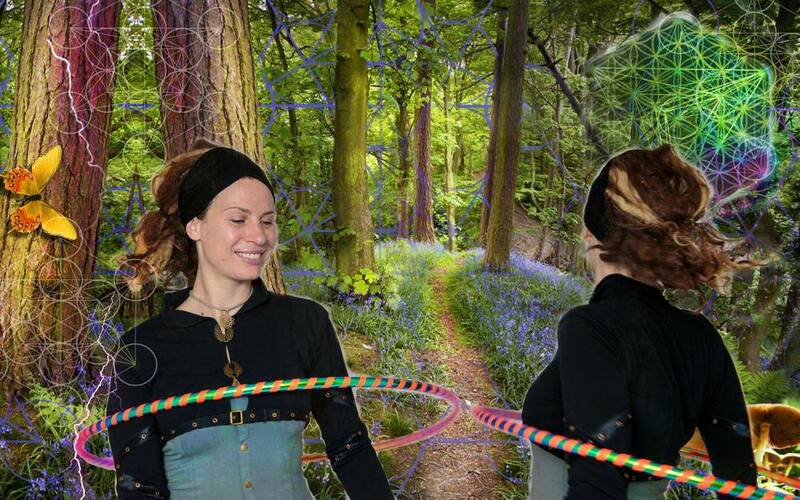 A hoop is a powerful energy gathering device. It’s a direct manifestation of the Flower of Life, the community of circles which exists at every scale and enables the coalition of vibration into matter. The infinitely complex sacred geometry derived from connecting the hearts of the circles in this pattern is the fractal algorithm that Nature uses to construct atoms, molecules, you, planets, stars and galaxies. You cannot help but to connect with source consciousness on an acutely momentary basis when you tap into flow with a hoop. If the desire to know your spiritual nature is present, consider that your relationship with the circle is no mere coincidence, but a deliberate and sacred gift from the Universe. May the Flower of Life open and reveal itself to you! 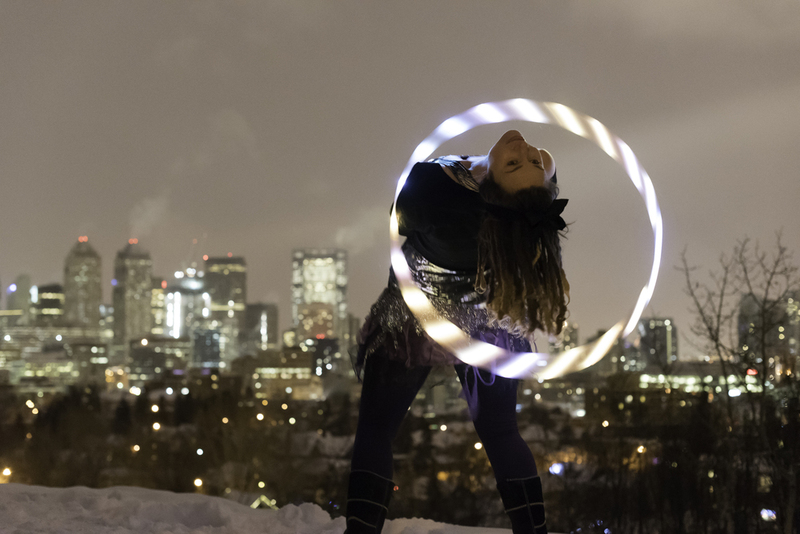 Geometric Revolution Hooping is based out of Calgary, Alberta. Add us on Facebook and check us out on Instagram to see these beautiful hoops in use. I can’t wait to create a custom hoop for you! These clips document my contributions to the Snow King Festival, an annual event held in Golden, a small town in BC where I lived for ten years and where GeoRev Hooping was born. This festival is held in late February when the long cold winter is almost over and spring is right around the corner. The entire town gathers together for months beforehand to create art and costumes. On the night of, no matter how cold, the thousand people fill the adorable town square in the isolated mountain valley under the stars and celebrate the promise of spring. A story is told. Giant Snow King and Spring Queen puppets walk across the historic wooden bridge and then the children have a parade. A Muse Troupe, the local collective of flow artists, fire spinners, stilt walkers, clowns, jugglers, actors, singers and other such whimsical people provide two main acts for the festival night. I'm very proud of my contribution to the 2015 Snow King Festival. I choreographed this nine person theatrical hoop dance and taught the troupe how to do some amazing tricks. The level of preparations that went into these costumes was unreal. Aliens and tree people, oh my! For the 2014 Snow King Festival, we all spun synchronized fire staff in addition to highlighting our individual talents. This is a short clip of my fire hoop solo. Two videos of my performance with A Muse Troupe at the 2013 Snow King Festival. This was my first time in a main role for this annual performance. I had been hooping for about a year and a half.